Born in Slovenia in July 2002, Zala Kravos was initiated into music at the age of three and started with piano lessons at five. At six, she entered the Conservatory of the City of Luxembourg, where she has studied piano, music theory, music analysis, harmony, and sight-reading. From 2012 to 2016, she studied at the Queen Elisabeth Music Chapel in Brussels under the direction of Maria João Pires and now continues with Louis Lortie, the new master in residence. She regularly participates to master classes with internationally renowned pianists. In 2009 and 2011, she won gold medals at the Luxembourg Competition for Young Soloists. She is also laureate of some international competitions, among which the International Piano Competition of France in 2011, the European Competition for Piano Solo Luxembourg 2014 and the AADGT “Passion of Music 2016” Competition in Carnegie Hall (New York). Since the age of six, she has been having several dozens of public appearances every year and has already performed in thirteen countries, including China and USA. She gave a first short recital when she was nine and her first full-time recital at the age of eleven. She has also played many times with orchestras in concertos by Berkovich (2010), J. C. Bach (2011 and 2012), Haydn (2013), Mozart (2013 and 2017), Beethoven and Ravel (2015). In Brussels, she played at the festival Classissimo in 2013 and at Flagey Piano Days in 2014. In 2013, she participated to the European Concert in the framework of the World New Music Days in Bratislava (Slovakia). In 2014 she was invited to the closing concert of the XVII International Festival of Contemporary Piano Music “ppIANISSIMO 2014” and in 2015 to the Piano Extravaganza Festival, both in Sofia (Bulgaria). In 2013 and 2014, she world-premiered two compositions written for her by the Luxembourgish composer Albena Petrovic Vratchanska. 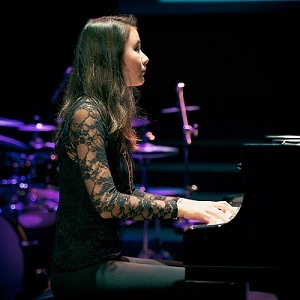 In 2013, she was invited to participate with a short composition of her own to the “Frida Kahlo Project” (original CD and multimedia show) and to record an impromptu by Schubert and another by Chopin for the jubilee CD marking the 150 years of the UGDA music education association in Luxembourg. More information can be found on Zala’s website. If you are interested in working with Zala, please get in touch with the EMCY Office.